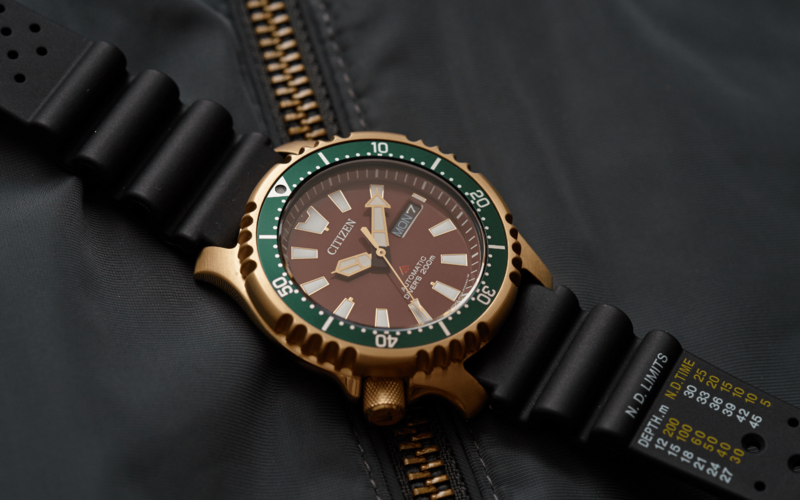 When it was released in 1993, the NY004 dive watch stood out for two reasons: The crown’s position at ‘8’ and the serrated bezel inspired by the Japanese pufferfish or fugu. And while it had a depth rating of 200m, it survived intact when the Comando Subacqueo Incursori (Italian Navy Seals) tested it to a depth of 500m, leading to a new dial emblazoned with the words “Marina Militare 500m Automatic”. This year, the watch has been updated as NY008. Aesthetically, it retains the crown’s position and fugu bezel. Its heartbeat is still a reliable automatic, Calibre 8203 with 40-hour power reserve. The key difference is the indices, which were adopted from those found on another legendary Citizen dive watch, the Aqualand. The NY004 featured round indices. Available only in Asia, there are five variants in limited edition of 1,000 pieces each. In Malaysia, the watch is also available as NY0082-17X, a special limited edition of 500 pieces with a brown dial, a green bezel and a rose gold-plated stainless steel case. Apart from the standard polyurethane strap, this model also comes with an additional Nato strap.